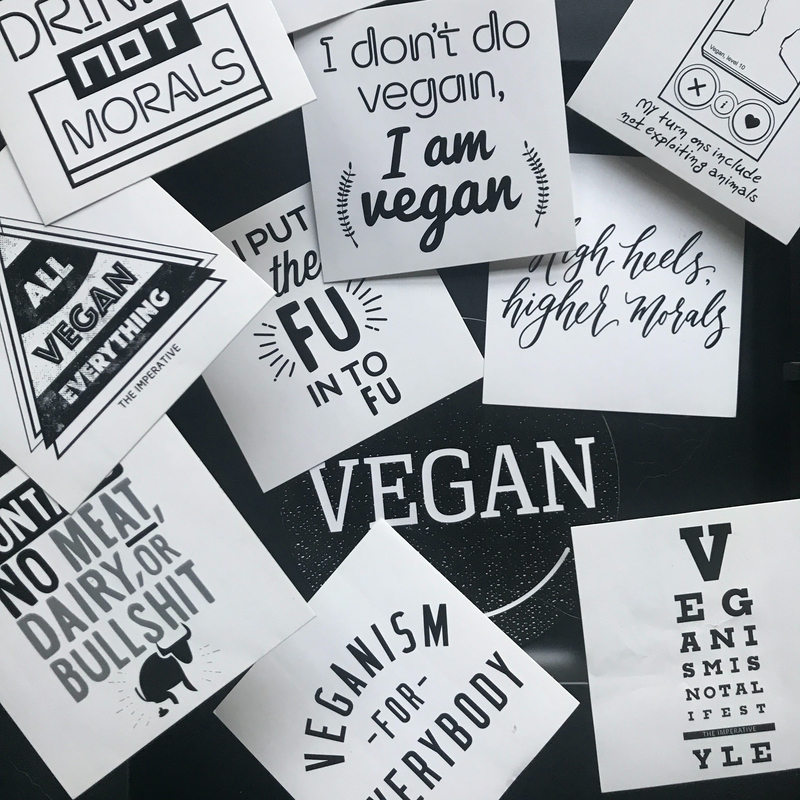 Easter is all about rebirth, yet it is celebrated with completely unnecessary killing and suffering of non-human animals; we have no good reason to inflict such violence, other than our palate pleasure. This recipe reclaims Easter by celebrating all animal life and demonstrating that palate pleasure and peace can coexist beautifully. After the traditional period of Lenten fasting, Easter is celebrated by preparing many high calorie dishes. A particular favourite of mine from Napoli is the casatiello, a typical Neapolitan stuffed bread made for Easter. It has been around since at least the late 1500’s. It makes its earliest printed appearance between 1634-1636, in the fable collection by Neapolitan writer Giambattista Basile, the Lo Cunto de Li Cunti, collected and printed posthumously. The collection includes the original Cinderella fable, entitled La Gatta Cenerentola, and it inspired Charles Perrault to write the version of Cinderella with which we are familiar today. In the original Cinderella, the casatiello is served at the king’s feast. The casatiello has a distinctive savoury, spicy, salty and cheesy flavour and this recipe achieves that fully (and I mean that it tastes exactly like the non-vegan one I had as a kid) without, literally, sacrificing anyone. This bread is hardly calorie free. It is certainly indulgent and contains processed foods (the meats and cheese), just as the non-vegan one would. Serves 8-10. 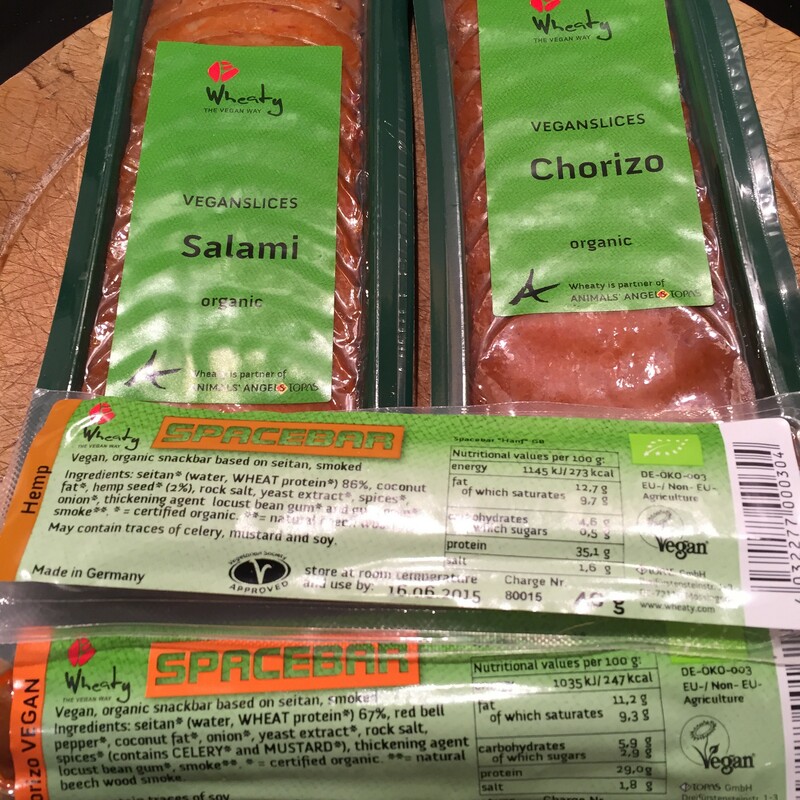 I have used the following vegan meats: Wheaty salami and chorizo (half of each packet) and Wheaty hemp and chorizo sausages (the entire sausages). Alternatively, I have also used Vegourmet’s Chorico Comino (and Fuego would be good too) and Salami. I used the following vegan cheeses: 50g Vegusto No Muh, Rezent/Piquant, 100g Bute Island Smoked Cheddar, 30g herbed Tyne Chease (before, I had used Bute Island Cheshire, but this year, I chose not to use it because it contains palm oil; perhaps, the ingredients have changed) and Vegourmet’s Jeezano parmesan. When choosing the meat and cheese, you may use whatever types you prefer and/or are available to you or you may make your own, of course. Whatever you use, choose spicy and highly savoury meats and a mix of mild and sharp flavoured cheese. Also avoid palm oil whenever possible. A note with respect to the flour, the combination of very strong white and wholemeal flours makes for a dense bread. That is my preference and the way it would be made traditionally. However, if you prefer a less dense bread, then use only very strong white flour (or all purpose bread flour). Weigh out the flour and sift it into a very large bowl. Add the black pepper and use a fork to mix it in with the flour. Dissolve the yeast into the water and once it has completely dissolved, add this to the flour mixture along with the olive oil and flax mixture and aquafaba. Coat your hands in flour and mix everything (or use a wooden spoon). It will get very very sticky. Once the dough is well mixed, then pour it out of the bowl and onto a heavily floured surface. 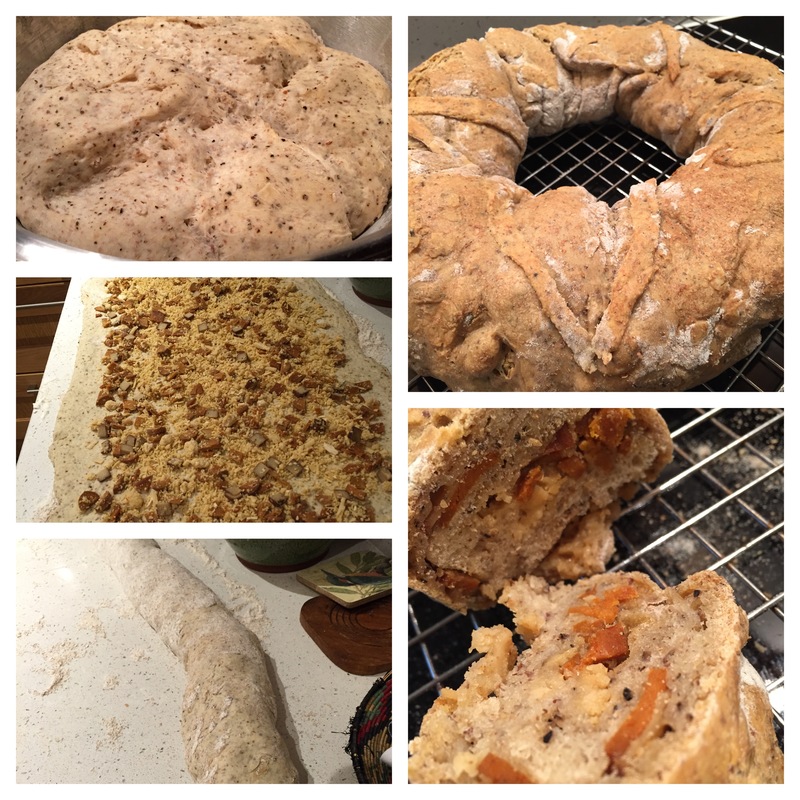 You will knead it for 10-15 minutes, until it has a good, springy consistency. Alternatively, if you have a hand mixer with the kneading wires, then use those in the bowl. It will make for a much less messy experience. Grease a bowl – very lightly – with olive oil. Place the dough into the bowl and cut a cross on the surface of the bread. Cover the bowl with a cloth and set it aside in a warm place to rise. 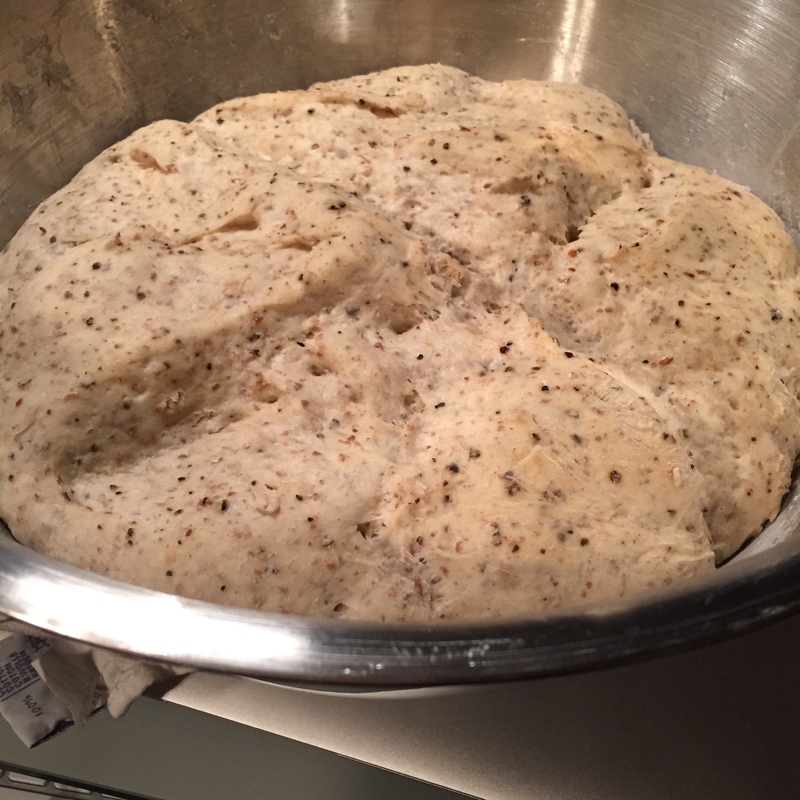 The dough should rise to at least twice its original size. To speed up the rising process, I like to turn the oven on ever so slightly, at the bare minimum – just to where the light will turn on – and place the covered bowl in the oven for at least two hours. While you are waiting for the dough to rise, prepare your meats in one bowl and mix the nutritional yeast, parmesan and cheeses in a separate bowl. Once the dough has risen, gently turn it out of the bowl onto a floured work surface. Punch it down and let it rest for five minutes. The dough will be sticky and particularly so if you have only used white flour. 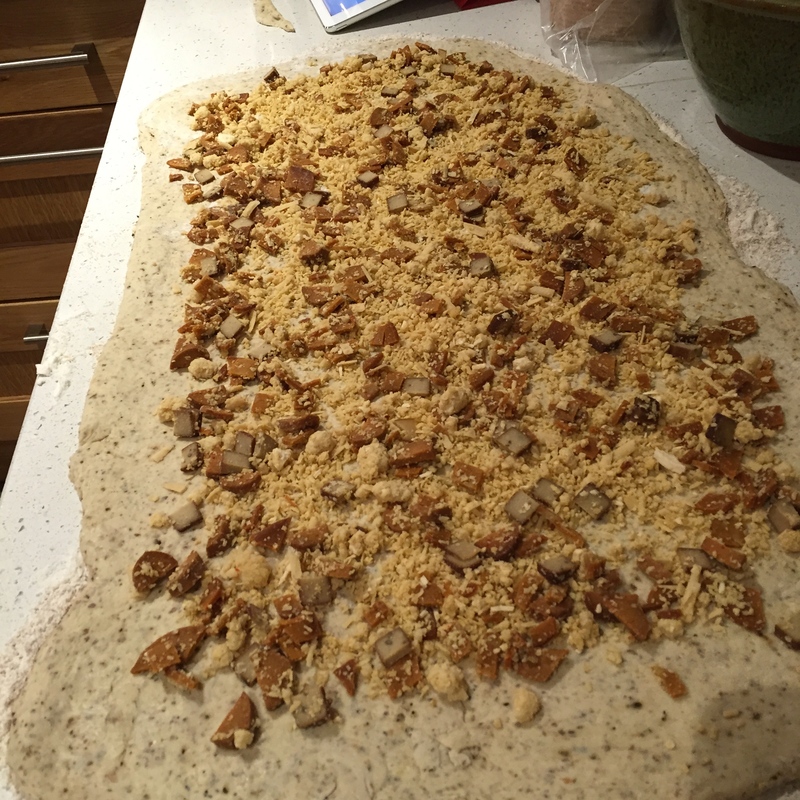 Roll out the dough into a rectangle (approximately 18×14 inches or 47x35cm). I cut away a small strip of the dough so that I could decorate the casatiello with one or more Vs for vegan, instead of the chicken eggs that are usually placed atop the bread. Spread the cheese and meats, ensuring you leave an empty border all around the dough. This will make it easier to roll and seal the bread. Have a baking dish greased and ready to go. 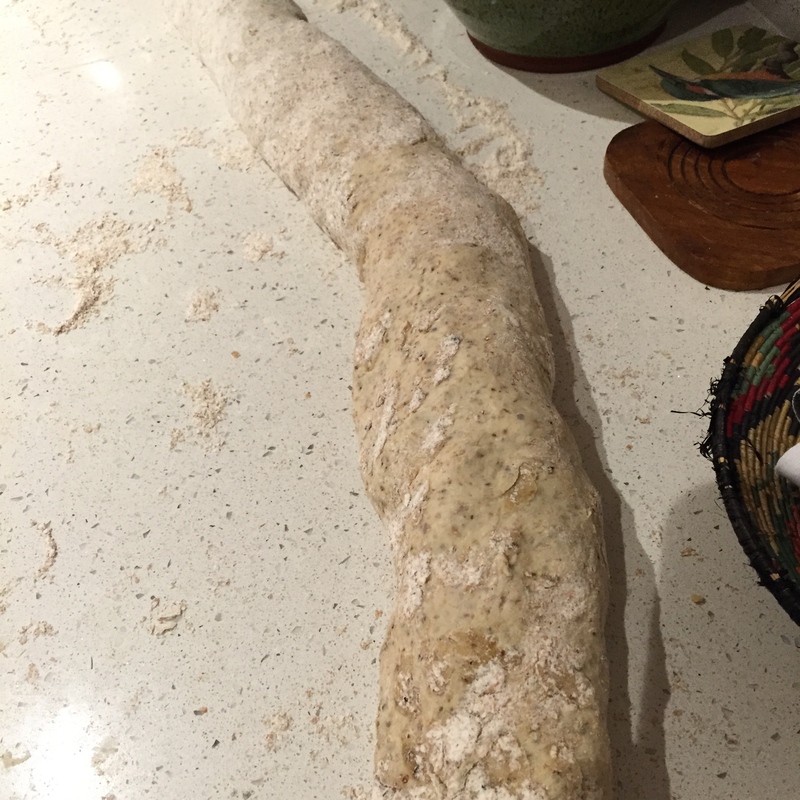 Roll the bread onto itself and seal up the ends. It will be tricky, so have a flat, metal spatula to help you. 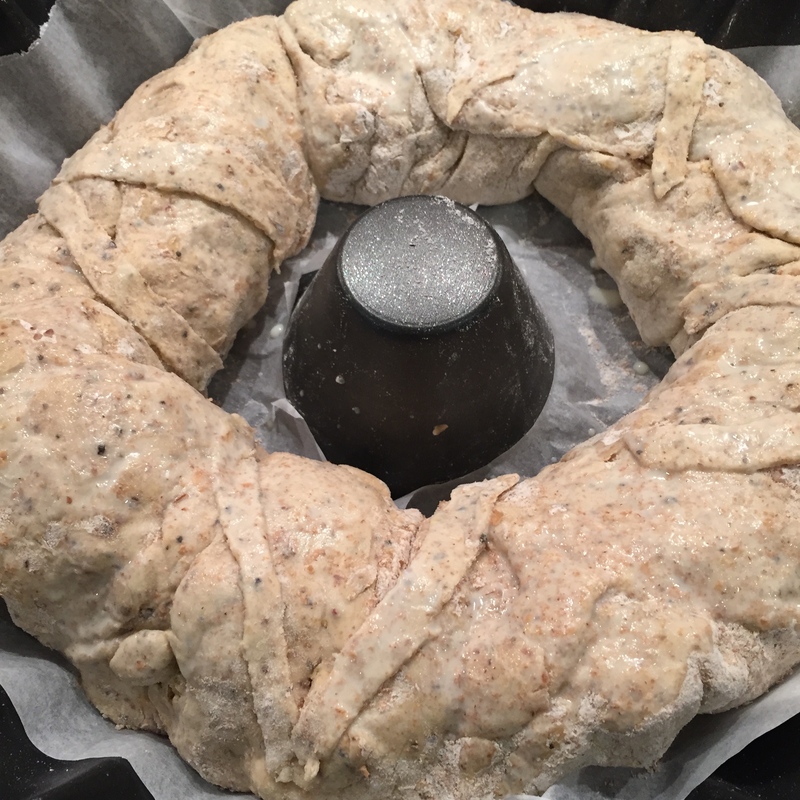 Place the giant roll into your tube pan and join the two ends by gently mashing them up together. Again, this will be tricky because of the size and somewhat unwieldy nature of the stuffed dough. Take the small strip of dough you set aside earlier and cut out the Vs if you wish. 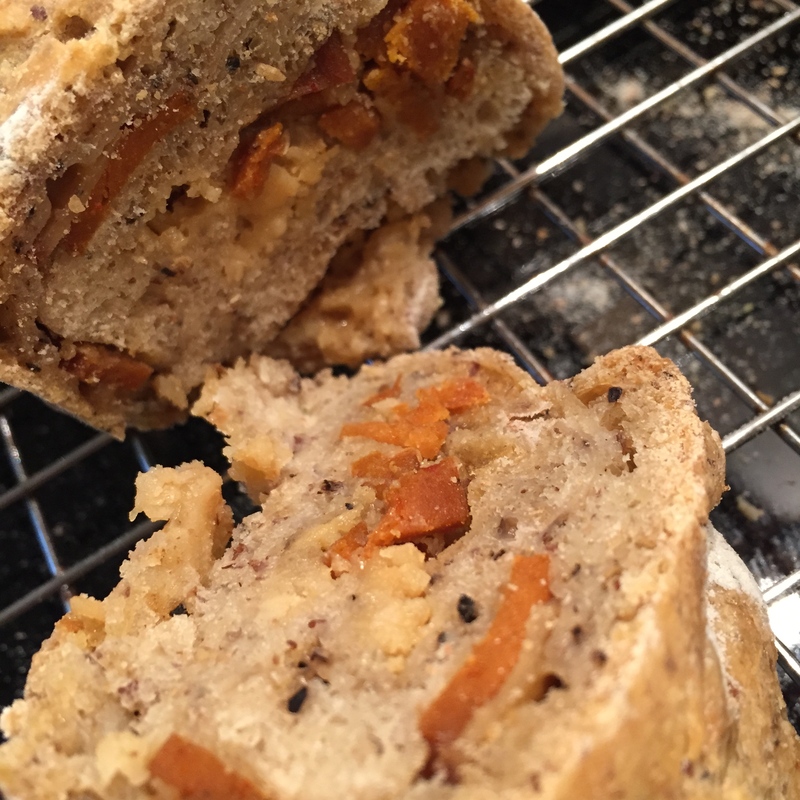 Use a bit of aquafaba to fix them in place them around the bread or just one, as below. Cover and set aside to prove in a warm place for approximately 30 minutes. The dough should have risen again to about halfway up the pan. Do not leave it too long. Once the casatiello has proven, it is ready to be baked. 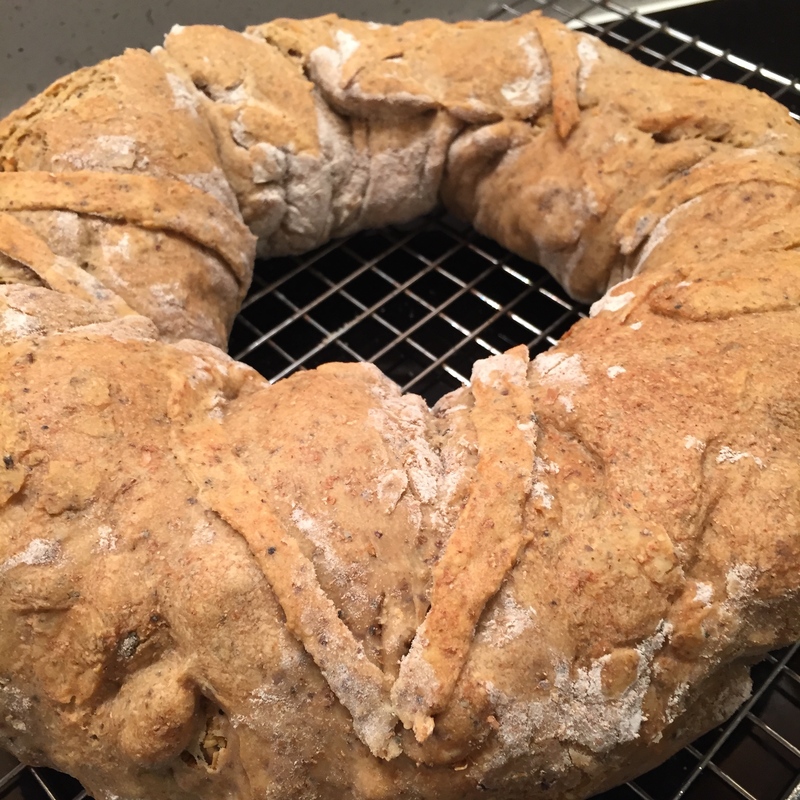 You may brush a bit of soy milk or aquafaba atop the bread to give it a glaze. Place into the oven at 200C for 40-50 minutes, depending on your oven. Check that the bread is fully baked by inserting a skewer and ensuring it comes out clean. Once out of the oven, brush a bit of olive oil on the top of the bread to give it more shine. The bread keeps well for about a week and may be eaten warmed up in the toaster or cold. Get your ingredients together to bake this classic Neapolitan stuffed Easter bread that was also served at the king’s ball in Cinderella!